Geoffrey de Havilland, born in 1882, was in his late twenties in 1909. He had a strong and enthusiastic interest in flying machines, but he was working in London as a draftsman, a job that did not allow him to express his enthusiasm for airplanes. Fortunately, he had a wealthy grandfather, and he invested £1000 with young de Havilland for the design and construction of his first airplane. Aviation then was much in the news. 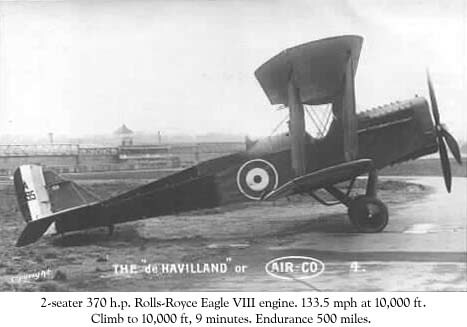 De Havilland proceeded to build an engine, while Frank Hearle, the brother of his fiancée, helped to construct the aircraft. While its wing broke on takeoff, a second airplane in 1910 was far more successful. It passed acceptance tests and became the first such craft to be purchased by the British government. De Havilland joined His Majesty's Balloon Factory in Farnborough in 1910 and set to work designing new airplanes. In 1914, only a month before the outbreak of World War I, he transferred to private industry and became chief designer at the Aircraft Manufacturing Company (Airco). He stayed at Airco through the war. There he achieved his first major success: the DH-4, a two-seat bomber that first flew in August 1916. Highly maneuverable and with a top speed of 143 miles per hour (230 kilometers per hour), it could outfly most fighters. In 1917, when the United States entered the war, officials in Washington selected it for production and built nearly 5,000 of them. DH-4s carried the early U.S. airmail; some also carried passengers. They remained in service through the 1920s. After 1918, the end of the war brought a sharp falloff in demand for new aircraft. The assets of Airco plunged in value, and de Havilland bought the company. With Airco now in his hands, he renamed it the De Havilland Aircraft Company. Incorporated in September 1920, it overhauled existing planes while constructing a small number of new designs for the Air Ministry and for newly formed airlines. Good aircraft need good engines, and De Havilland was dissatisfied with those that were available. His long-time friend, the engine designer Frank Halford, modified a French motor and came up with one that was lighter in weight and simpler in design. The company then set up a strong in-house engine division. Its motors powered De Havillands highly successful Moth family of aircraft. The first such airplane flew in 1925, ushering in a line that stayed in production through World War II. These included the Gipsy Moth that used Halford's Gipsy engine, the Giant Moth, Hawk Moth, Puss Moth, Swallow Moth, Tiger Moth, Fox Moth, Leopard Moth, and Hornet Moth. They served as private planes, trainers, and light airliners. In 1934, De Havillands Comet Racer won an air race that ran halfway around the world, from London to Melbourne, Australia. This Comet beat a highly touted U.S. entry, the Douglas DC-2. In an era when boxy biplanes still were common, the Comet showed a highly streamlined form that foreshadowed the speedy fighter aircraft of a decade later. All-aluminium designs had not yet become standard, and the Comet was built with plywood. De Havilland used the same construction in an early four-engine airliner, the Albatross, which flew in 1937. Drawing on this experience, the company proceeded to use plywood in crafting one of the outstanding aircraft of World War II: the Mosquito. There were plenty of woodworkers in England, which made them easy to construct. During much of the war, the Mosquito was the fastest airplane on either side. Nearly 7,000 of these twin-engine craft were built during the war. They performed superbly as fighters, light bombers, and in camera-carrying versions used for photo-reconnaissance. An advanced version, the Hornet, remained in production until 1952—well into the jet age—and stayed in service until 1959. De Havilland also took the lead in building jets. The inventor Frank Whittle constructed an early jet engine prior to the war. In January 1941, the senior British aviation official Sir Henry Tizard asked Halford and De Havilland to design a new jet interceptor and a new engine. Halford simplified Whittle's design, crafting a successful engine called the Goblin. It powered the Vampire fighter, which first flew in September 1943. This led the company to build post-war jet fighters: the Venom and the Sea Vixen. In 1944, De Havilland was knighted and became Sir Geoffrey. This high point in his life coincided with the high point in his company's fortunes. In the post-war world, with America ascendant, he continued to pioneer but lost repeatedly to the Yankees. He built the DH-108, an experimental jet powered by a Goblin that was to break the sound barrier. One of them broke up in flight, killing the pilot—his son, Geoffrey, Jr. A DH-108 indeed flew supersonically in September 1948. But by then America's Chuck Yeager had already done this in the rocket-powered X-1, and George Welch had done so as well in the XP-86, which went into production as a fighter. De Havilland built the world's first jet airliner: the Comet, named for the 1934 racing plane. Fitted with four of Halford's more powerful Ghost jet engines, the Comet entered test flight in 1949 and first carried paying passengers in May 1952. People fell in love with it. Its speed of 480 mph was unrivalled. It flew at high altitude, avoiding discomforts of the weather. Its engines ran smoothly, eliminating the harsh vibration of conventional motors. Orders poured in. But during 1954, two Comets broke up in midair. Investigation showed that this airliner was subject to a new and unanticipated type of structural weakness. All remaining Comets were withdrawn from service, with De Havilland launching a major effort to build a new version that would be both larger and stronger. This one, the Comet 4, enabled De Havilland to return to the skies in 1958. By then, though, it was too late. The United States had its Boeing 707 jetliner along with the Douglas DC-8, both of which were faster and less costly to operate. The Comet soon faded, as orders dried up. De Havilland also pushed into the new field of long-range missiles, developing the liquid-fuelled Blue Streak. It did not enter military service but became the first stage of Europa, a launch vehicle for use in space flight. In flight tests, the Blue Streak performed well—but the upper stages, built in France and Germany, repeatedly failed. In 1973 the Europa program was cancelled, with Blue Streak dying as well. The last of them wound up in the hands of a farmer who used its commodious fuel tanks to house his chickens. De Havilland returned to the airline world in 1962 with a three-engine jetliner, the Trident. However, he designed it to fit the needs of one airline and one man: Lord Sholto Douglas, chairman of British European Airways. Other airlines found it unattractive and turned to a rival tri-jet: the Boeing 727. De Havilland built only 117 Tridents, while Boeing went on to sell over 1,800 727s. In 1959, De Havilland Aircraft merged with the firm of Hawker Siddeley Aviation, while the engine division became part of Bristol Siddeley. Sir Geoffrey died in 1965. He had pioneered from aviation's earliest days until well into the 1950s. But after the war, competing with the United States, he repeatedly fell short. 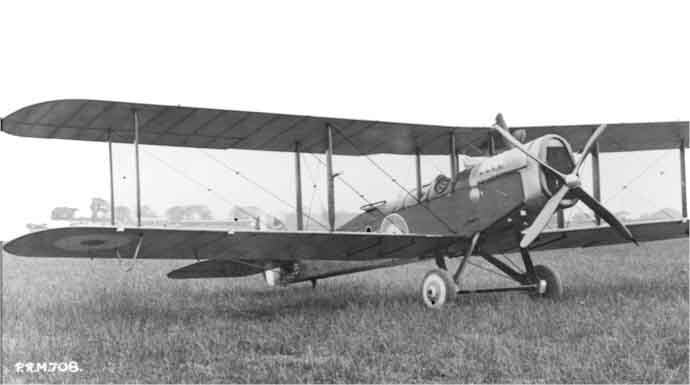 The De Havilland DH-4 was the only US built aircraft to see combat during World War I. When the US entered the war in April 1917, the Aviation Section of the Signal Corps only had 132 aircraft, and all were obsolete. Colonel R. C. Bolling was commissioned to study current Allied aircraft designs being used at the front and to arrange for their manufacture in America. Several European aircraft were considered, but the DH-4 was selected because of its comparatively simple construction and its apparent adaptability to mass production. After completing trials in October 1917, production contracts were placed for the DH-4. It was dubbed the "Liberty Plane." By the end of the war on November 11, 1918, three U.S. manufacturers were building them. The largest producer was the Dayton-Wright Airplane Company of Dayton, Ohio, which built 3,106 airplanes. The Fisher Body Division of General Motors Corporation of Cleveland, Ohio, produced 1,600 aircraft, and the Standard Aircraft Corporation of Patterson, New Jersey, built 140 machines. Plans were under way to produce an additional 7,502 DH-4s, but orders were cancelled after the armistice. 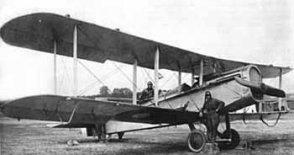 The first American-built DH-4 reached France on May 11, 1918. However, they needed to be made combat ready and the mission was not flown until August 2. By war's end, thirteen Army Air Service squadrons, five of them bomber squadrons, were equipped with the Liberty Plane. In addition, four combined Navy-Marine squadrons were flying DH-4s along the Belgian coast. Of the 4,346 DH-4s built in the United States, 1,213 were delivered to France and of those only 696 reached the Zone of Advance. 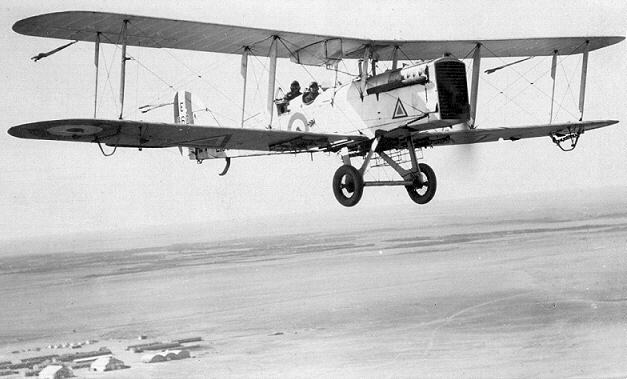 Although the American DH-4s were in combat for less than four months, they proved their worth. Of the six Medals of Honour awarded to aviators during the First World War, four were received by pilots and observers flying DH-4s. The DH-4 continued in military service for many years after the war. It was the principal aircraft used by the U.S. Government when air mail service began in 1918. A few were transferred to the new airlines that took over the mail services in 1926-1930. The U.S. Army Air Service, later Army Air Corps, operated them until 1932. 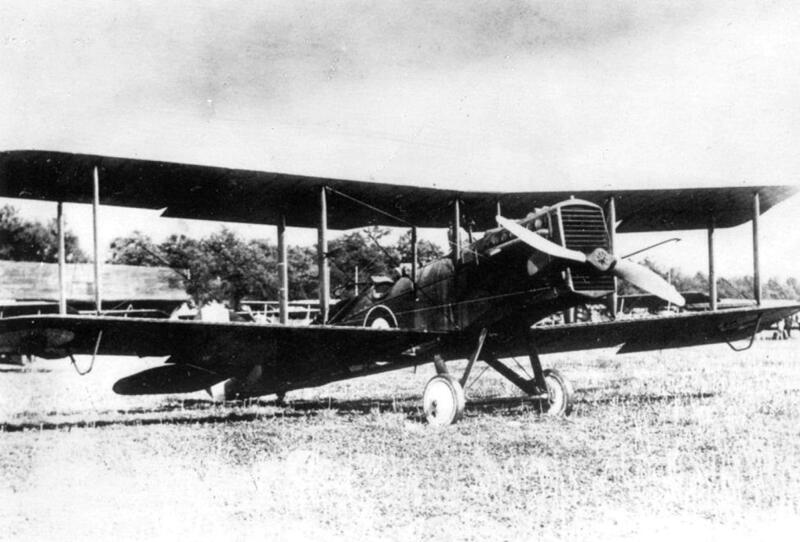 The War Department transferred the NASM DH-4 to the Smithsonian Institution in 1919. The National Air and Space Museum restored the aircraft in 1980-1981. Except for the mainplanes and ailerons, built by Glendower. The De Havilland D.H.6 was designed at the outset as a two-seat elementary trainer. It was also designed with simple features and lines for rapid production. The type acquired an unusually high number of nicknames including "the Sky Hook", the Crab", the Clutching Hand", "the Flying Coffin", "the Dung Hunter" and "the Sixty". In addition to training duties the design was also pressed into service by the RNAS as an anti-submarine patrol aircraft. 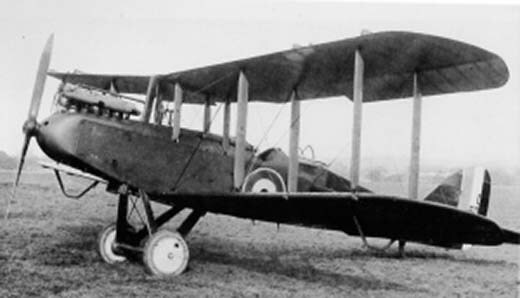 The D.H.6 also became the first British aircraft design to be license-built in Canada, when a single example was built for the Commanding Officer of the RFC in Canada. The D.H.6 was subsequently rapidly replaced by the more popular Avro 504 design in the elementary training role. Canadian crews came into contact with the D.H.6 while serving with either the Royal Flying Corps or the Royal Naval Air Service. Built by Harland & Wolff. Built by Morgan & Co. This aircraft was known to have been flown by Lt C.A.McConville. The D.H.9 was once, aptly, described as a ‘D.H.4 which had been officially interfered with so as to be suitable for mass production and the B.H.P (Beardmore-Halford-Pullinger) motor’. The chief alterations being the repositioning of the pilots cockpit to a point behind the centre section, and a partially cowled motor with the radiator beneath the fuselage instead of behind the airscrew. At the expense of a lower top speed, the bomb load was increased by 500lbs. Widely used as a day bomber; the D.H.9 certainly had its share of troubles, particularly with the B.H.P. motor which proved unreliable and was largely obsolete by the time the aircraft reached production. Bombing formations were often reduced in strength before they crossed the lines since the motors of some machines could not develop sufficient power to enable them to keep station. Despite these shortcomings the type was produced on a grand scale, with no less than 2100 being built by the war’s end. 1 .303 Machine gun (forward). 1 .303 Lewis gun (aft). Built by Westland. This aircraft was known to have been flown by Lt C.A.McConville. Built by Cubitt, delivery up to D727 only confirmed. Aircraft went to Greek Government. Built by Waring and Gillow. Became G-EAZK then appears to have been transferred to Belgium Air Service. To US Government for USMC Northern Bombing Group.